You are here: Knowledge Base » Add-ons » MailChimp User Sync » Configure webhook for 2-way synchronizing. Configure webhook for 2-way synchronizing. By default, MailChimp Sync will only synchronize data from your WordPress site to the selected MailChimp list. Not the other way around. However, it is possible to have the plugin “listen” to changes in your MailChimp list as well. To do this, you need to set-up a webhook in your MailChimp account. This webhook will inform us of changes to your MailChimp list. Example: when a subscriber updates his profile, MailChimp will send a request to the plugin so we know to update the corresponding WordPress user. To configure the webhook, please log in to your MailChimp account and take the following steps. 1. Go to the list you selected in the MailChimp Sync plugin settings. 2. 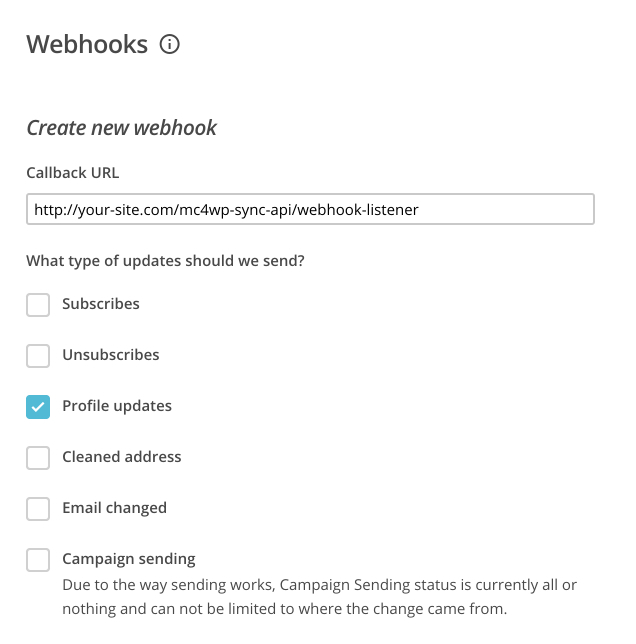 Go to Settings > Webhooks and click the Create new webhook button. 3. Enter your site URL followed with /mc4wp-sync-api/webhook-listener in the Callback URL field. Select “Profile Updates” and uncheck all other options. 4. Make sure the “When a change is made via the API” option is unchecked. MailChimp Sync will now be informed of changes to your MailChimp lists and update the corresponding WordPress user accordingly.